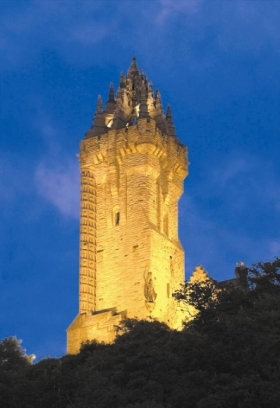 The brainchild of the Reverend Charles Rogers, the National Wallace Monument is a magnificent tribute to the legend and legacy William Wallace, Guardian of Scotland and martyr of the War of Independence. It sits atop the Abbey Craig - from where, on 11th September 1297 - the fabled 'Braveheart' led a rag-tag half-starved Scots force to defeat a much larger, stronger, better armed English force at the Battle of Stirling Bridge. Built by public subscription, some 140 years ago, it's erection owed as much to donations from ordinary Scots and expatriates as it did to aristocratic sponsors such as the Marquis of Bute, or those, like the revolutionary leader Garibaldi, who were inspired by Wallace's indomitable spirit. The day it's foundation stone was laid saw Stirling's population more than double - and it is still a place of pilgrimage.